The on sale ladder back comes standard with an upholstered seat. You can choose between 3 different vinyls: Black, Wine & Buckskin. A solid wood seat is optional. If you require a different upholstery please check out the following link - #CAF-4200. The wood chairs sold by Restaurant Furniture Canada are made especially for commercial use and constructed to withstand the heavy use common to the restaurant and hospitality industry. The chair is assembled with a Mortise & Tenon construction and reinforced with Metal L Shaped brackets for more structural stability. 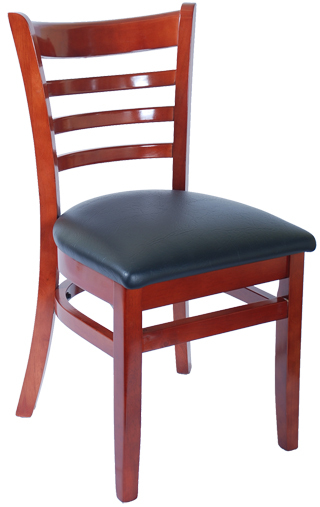 For more additional information about other on sale wood restaurant chairs please call (888) 998-4222.